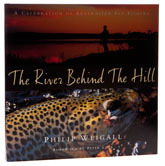 Subtitled “a celebration of Australian fly fishing,” this one is a must for any readers who are even slightly curious about the availability of fly fishing down under. Rick Keam sent it to me when I confessed I had knew nothing at all about fly fishing in Oz and I am eternally grateful to him for doing so. As a fireside read, this is a book with few equals; not only is it well written, but the photography is absolutely superb and the pages are littered with big colour plates that left me wondering why we know so much more about New Zealand’s trout than Australia’s. If you are planning a trip, then this is a book to get, because at the back there is a very useful guide to Australian fishing waters, with just enough maps to make it possible to work out where to stay. Tasmania is, of course, the classic Australian trout destination, but this book will introduce you to the Snowy mountains, the Monaro, the Canberra district, the upper Murray river and the varied landscapes of Victoria. On second thought, get a copy even if you aren’t planning on going.